Soap, toothbrushes and toothpaste, extension cables, eggs, lightbulbs……….. these are just a few of the items available from the Ganesh store in the village of Aihole, Karnataka. 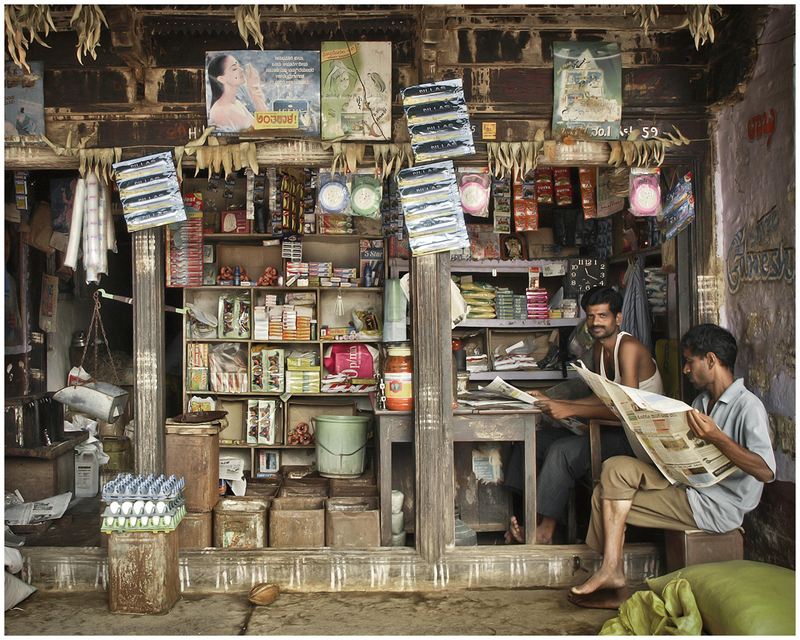 The owner reads his newspaper while waiting for his mid morning customers…….. Brilliant shot….love the complexity of the image. Thanks Adrian, it was very difficult to decide how much to leave and how much to crop. In the end I decided to crop only a little because I too liked the busy disorganised complexity of it. I like your old man post for today on your interesting blog. Love it! I think this would also look great in B&W! Hello Sonya, and thanks………. I was in two minds. It needed some colour, but not fully saturated, so I compromised. I really love the juxtaposition of contrasting elements in this shot. For example, the simplicity of certain geometric shapes within the crop (floor, ceiling, walls and wooden frames) with the complexity of shapes in the stacked / hanging merchandise. The calmness of the shopkeepers pose and demeanour combined with the general sense of chaos with all the colours / shapes packed into a small space. Also, (my favourite bit of all) – is your decision with the colour saturation. I love how it is both subtle and colourful – this is what attracted me instantly. To my mind, it is the perfect choice for this particular image. Lovely! Great shot – the detail is what really makes it. You pulled the color off exactly right. Hi Bill, good to hear from you. Thanks, I eventually got the colour about right. Great shot. Keeping it ‘busy’ without too much colour taking over is perfect. Hello Noeline, and thanks very much. Great shot, could spend hours browsing! Perfect mix of detail and balance. My favorite of your work. This tells the story of many Indian peoples lives..